" No road closure. We just apply one-way system and traffic light, as well as traffic diversion"
Jakarta Transportation Dept. is about to apply traffic engineering trial at the intersection of Matraman today until July 27, 2017. Jakarta Transportation Dept. Head, Andri Yansyah said, traffic-engineering trial is to parse traffic jam from the impact of underpass development at the site. "No road closure. We just apply one-way system and traffic light, as well as traffic diversion," he expressed, Wednesday (719). He expressed, vehicles on Jalan Salemba Raya from Diponegoro Intersection until Matraman Intersection will be applied one-way system, precisely from north towards south, except Transjakarta bus. While for Pramuka Flyover-Salemba that previously designated to the passing vehicle from Jalan Pramuka to Jalan Salemba will be changed in reverse direction. Then Matraman Intersection, will not be controlled anymore through traffic light, except Transjakarta bus. "Megaria Intersection is also the same. 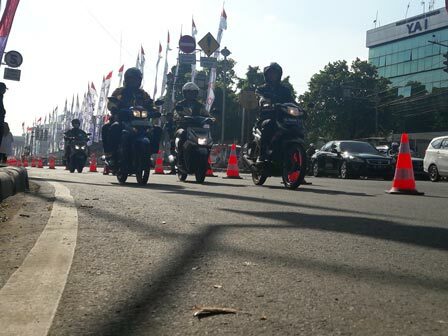 Especially for Diponegoro Intersection, there will be phase adjustment and cycle time," he stated. While the diversion will be applied to traffic from Jatinegara towards Pramuka and Senen. Vehicles that usually turn right or straight at the traffic lights of Matraman Intersection, will be rerouted to Jalan Matraman Dalam-Proklamasi-Diponegoro to return to Jalan Salemba Raya. Vehicles heading to Senen will be rerouted to turn left and other vehicles that lead to Pramuka will be directed to turn right towards Matraman Intersection and then turn left. Similarly, vehicles from Manggarai towards Senen or Pramuka through Jalan Tambak, will be rerouted through similar routes above. Then from Proklamasi towards Cikini or Tugu Tani, vehicles that pass through Jalan Pegangsaan will be rerouted to Jalan Diponegoro and turn left at Intersection of Jalan Teuku Cik Ditiro. Similarly, vehicles from Pramuka towards Senen that often pass through the flyover on right side toward Salemba Raya will be diverted. Vehicles are directed to use the flyover towards Jalan Matraman Dalam to go to Proklamasi-Diponegoro Road to return to Jalan Salemba Raya to Senen. Additionally, to reduce traffic jam at Matraman Intersection, traffic on Jalan Salemba Tengah will be applied one-way system. In alternative access towards Jalan Pramuka, the engineering will be applied 24 hours. "To support it, 100 joint personnel of Police and Transjakarta will be sent to the field. Therefore, the motorist must obey and follow the officers' direction in the field," he said.